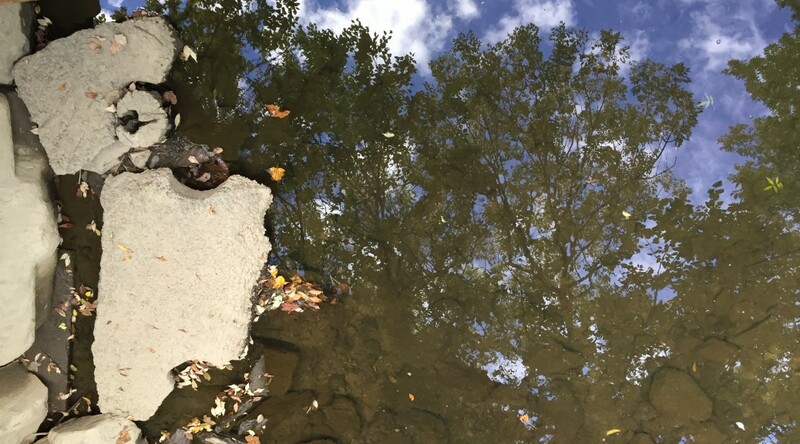 I took this photo today realizing how the leaves are now scattering from the trees into the water. With the water below me and the trees above me I was able to feel somewhat suspended from my moment to moment and to experience some of the ‘letting go’ that comes with this season. Pausing, reflecting, appreciating, I wondered whether there was anything I could or wanted to let go of to build something different within myself. If I could change one thing I would spend more time outside in nature. With our fast paced work life I find that I am more often than not, on my way to the next thing. I glimpse to the side to notice what flowers are blooming and which are fading. If this glimpse could change to a pause, what would really change? Would I be late? Would I need to work a shorter day? I would be more grounded to nature and to the earth. Just breathing this time of year I am struck with how clear the air is and how my lungs long for this deep connection that comes with the breath. So again, just to breathe, demands that I slow down. This is what happens in the Fall and according to Chinese Medicine in the Metal Element. And while this element is about letting go, it is by definition all about finding that part within each of us that is rich, valuable, precious and brilliant. There is an inner value within us that enables each person to connect to the heavenly aspects of being while still grounded on this earth. It is necessary and fulfilling to pause to know your own deeper self and spirit. And this again requires that you pause to experience this. We are at the moment of the Equinox and the calendar’s marking of fall, I invite everyone to take a longer pause than usual to appreciate where you are and to gather from nature all the energy of letting go that will serve you right now. I found a poem this weekend that I had forgotten. Please enjoy it. I take the Metro to my office by Dupont Circle in DC. I decided a while back that the 35 minute ride was a wonderful opportunity to meditate. Sometimes I even fall asleep and wake up exactly at my stop. I’m not unaware of what’s going on around me. A couple of weeks ago while in my deep meditative state, I was aware of something happening in the seats across the aisle. There was a young man under 30 years making attempts, quite loudly, to speak with the woman next to him. He didn’t read social cues at all as this woman had erected an invisible fort around her. Even with my eyes still closed, from a deep-rooted place within me, I realized his frustration at this situation. I was pulling myself out of my meditation to be awake and engage with him when we came to a stop. The woman got out. I was getting ready to talk with him, but another woman sat down and she lovingly engaged him in conversation. She was a woman in her late 40s or 50s and they ended up talking about the characters in Frozen. This is something that I would not have been able to do. He got off the metro at the next stop more calm and collected. Another woman standing there holding onto the railing started to speak to the woman, “I have a nephew just like him”. And they began a conversation more or less on kindness and accepting people where they are. In every situation there is time for recognizing our humanity and connectedness and to find that heartfelt, loving place from which to respond. Practicing acts of kindness are now considered a health practice. Studies show that it has a positive effect on the immune system and on the production of serotonin. But don’t do this as a health habit. Just be kind as a way to love yourself and everyone else, and to connect and be part of the natural flow of life. There are so many opportunities. If you can’t imagine being like this woman then donate blood, or write a sympathy or thank you note, smile at people, or give a complement. And remember that we really are all one family. Being kind to each other is one of the best things about being alive.